One of the most powerful micro algae, chlorella is a deeply nourishing, energising green supplement that offers many benefits. Here we explore this essential plant, outlining chlorella’s benefits, nutritional components, uses as a heavy metal detoxing agent, and more. We believe chlorella is a gift to humanity, a deeply nutritious plant which offers a surge of true vitality and wellness. Along with its cousins marine phytoplankton and spirulina, it is amongst the healthiest things you can put into your system. From the Latin chloros, meaning green, chlorella is a single celled algae with powerful health properties for humans. Like marine phytoplankton it has the power to photosynthesise and indeed it is so efficient at this that some scientists hypothesise that it may one day serve as a primary food crop because of it’s immense photosynthetic efficiency. Although it’s a useful everyday supplement, many people take chlorella specifically for its usefulness as a heavy metal chelating agent. For those suffering from mercury amalgam exposure, or other heavy metal toxicity issues, chlorella offers a natural method of chelation that can bind to the metals and help flush them from your system. Often used in conjunction with cilantro (coriander leaf), chlorella should be used in larger doses and over a considerable period of time to really clean out heavy metals. Does Chlorella Have Vitamin B12? There has been a lot of debate in health circles over the last few years about whether chlorella represents a true vegetarian source of B12. Until recently it was thought that B12 simply didn’t exist in plant based foods. However, recent evidence suggests that the one exception to this is algae and amongst these particularly chlorella. One interesting study demonstrated that contrary to assertions that chlorella only produces a kind of pseudo vitamin B12, it actually produces the real thing. However, the levels are still relatively low compared to meat products and severl doses would have to be consumed per day to really give you an adequate amount. On the plus side, since chlorella offers so many other benefits this makes it a strategy with multiple advantages. Chlorella is not just vegan, it’s one of the most important vegan supplements! With a near perfect source of vegan protein, and useable amounts of B12 (methylcolbalamin), chlorella is a single celle plant that offers tremendous benefits to a pure herbivorous diet. 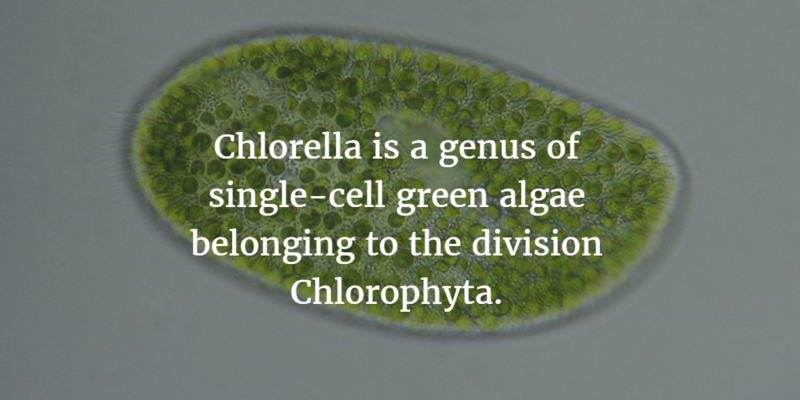 As a wild plant, chlorella grows in fresh water lakes. However, for the purposes of harvesting chlorella as a health supplement, it is best grown in specialist micro-algae production facilities known as bio-reactors. These are essentially concentrated spirals of glass tubing in which the natural conditions for the algae’s growth: water, light and correct temperature can be replicated. What is Chlorella Used For? What’s Better: Chlorella Powder or Tablets? We prefer the pure, unadulterated chlorella powder to either the compressed tablets or capsules. The process of encapsulating things in veggie-capsules is fairly expensive so, generally speaking, you are getting more for your money via the powder and it stands to reason that absorption will be optimal. Should I have Broken Cell Wall Chlorella? If there is one nutritional ‘flaw’ of chlorella it’s the plant’s cell wall which is relatively tough and, according to some pundits, locks away the core nutritional value. As per this theory, a number of companies espouse broken cell wall chlorella which is where a mechanical process part-crushes the plant to render it more digestible. Other scientists, however, argue that this very process of breaking the cell wall encourages oxidisation and basically encourages mould. Currently, the industry boasts a lot of companies claiming that their method of breaking the cell wall is the most advanced and leaves all others in their wake. You’ll find websites advertising ‘Cold Milling’, ‘Cracked Open Wall’, ‘Vacuum Pressure Differential’, ‘Sound-Wave Broken’, ‘Spray Dried’ and many other variants on this theme. Our take on this is that, like all of us, plants respond to the conditions in which they’re grown. We treat our chlorella with kid gloves, which means we’re thinking about giving it a stress free growing experience at every step of the way so that it doesn’t feel the need to toughen up. This means we are encouraging a thinner cell wall, which hugely improves digestibility. And when this is done properly, you don’t need mechanical means to pulverise the end result.